This is such a pretty blue, it is very office appropiate and low key, even with the hidden shimmer that it has. Sometimes it looks more grey depending on the light source, but I love it under the sun, so I took lots of sunny pictures. I was also thinking to wear this for an upcoming "It's a Boy" baby shower, it's the perfect blue for the occasion. This is another two-coater, and like all Butter London Nail polishes, it applies like butter! 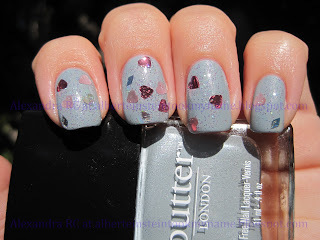 BONUS PICTURES - Butter London Lady Muck with Pa AA08! so pretty, your pics make it look sooo gorgeous! It looks fantastic! it leans really blue on you, it leaned much greyer on me. it's gorgeous either way! Loved the detail of hearts!!! @ Rafaa C.: thank you! Wow, this color is amazing on you - I think these are the best photos I've seen of it! @ IDNP: Thank you! I know I wanted to add something sweet, so the hearts were perfect. @ ABOP: Thanks! I love how these sunny pictures came out! 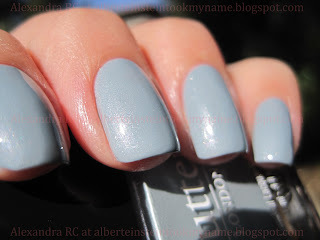 I love that grey-blue color! I really need to try Butter.